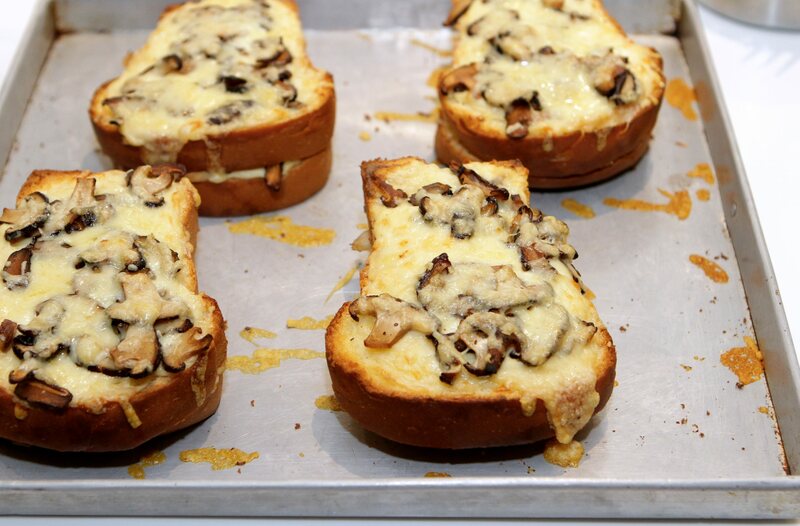 This cheesy Shitake and Comte Cheese Croque Monsieur will soon become your new favourite comfort food. With generous servings of mushrooms and cheese, what could go wrong, really? In a saute pan, melt the butter over low heat and add flour. Cook for 5 minutes and pour in the milk, chicken stock powder and nutmeg. Mix well, and simmer for 5 minutes. Season to taste and set aside. Slice sandwich loaf into 1cm thick slices, and brush with melted butter. Spread bechamel onto the bread. Top with shitake mushroom and cover with slices of ham and sprinkle cheese on top. Cover with another slice of bread. Spread bechamel on top and sprinkle with cheese. Roast in the oven at 210 degree Celsius until top is golden brown.